As worried fans watched live via webcam Monday, a great horned owl chick jumped two stories from its window-sill nest at the Desert Research Institute in Reno. Season one of Nevada’s most popular owl-based reality show has taken a dramatic turn. As worried fans watched live via webcam Monday, a great horned owl chick jumped two stories from its window-sill nest at the Desert Research Institute in Reno. 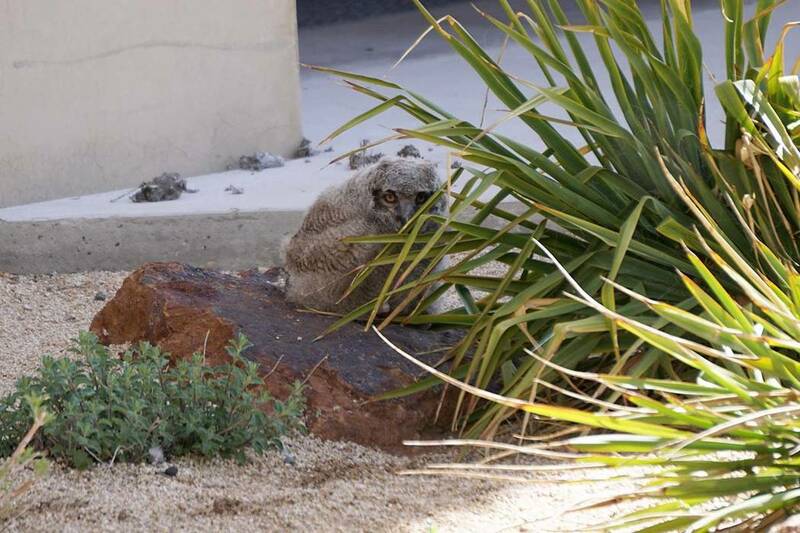 But here’s a welcome spoiler from the Nevada Department of Wildlife: The owlet landed safely on the ground and appears to be doing fine so far. “It basically fledged,” Aaron Keller, the department’s outdoor education coordinator, said Tuesday. NDOW and DRI staff members are keeping their distance in hopes the wayward chick will be fed and protected by its parents until it is ready to fly. “Luckily for this owlet, it basically has two mothers — two females and a male looking out for it,” Keller said. The department and the DRI, the research arm for the Nevada System of Higher Education, established the “DRI Owl Cam” livestream on YouTube so people could observe the nest without disturbing the birds. Biologists knew they had an unusual show on their hands even before the camera went live March 15. Keller said it’s rare for two female great horned owls to nest so close together, let alone take turns sitting on each other’s eggs. The two females laid five eggs between them, but only two of them hatched, the first on March 23 and the second a day or two later. Wildlife officials named the first chick Washoe, after its county of origin, and the second Zephyr, because it hatched during a windstorm. The larger, browner female is Sienna. The smaller, grayer female is Jina, and the male who tends to them is Arie. Keller said the webcam has developed quite a following, with viewers across the country and around the world. He said he tuned into the livestream on YouTube at 10 p.m. one night and discovered 275 people watching it. “I clicked on it just now. There’s 300 people watching,” Keller said. Even NDOW employees have gotten swept up in the drama. “We were basically watching when the owlet got up on the ledge,” Keller said. “A woman in our office said, ‘I can’t look. I can’t look!’” just before the two-story dive. The department posted an update later Monday, noting that the chick sat up after its fall and took a nap with its head down, which looked alarming but is perfectly normal. Since then the owlet has been spotted stretching its legs and wings and watching a nearby lizard. Keller said officials will discuss possible intervention if it looks like the parents have abandoned the chick. Usually the preferred option is to let nature take its course. But viewers should be warned: In the natural world, happy endings are never guaranteed. Like any owlet that leaves the nest before it’s ready, Nevada’s youngest reality star could “find itself at the bottom of the food chain,” Keller said. — They don’t wait until spring to lay their eggs. They often begin nesting in late January, when the snow is falling in Northern Nevada. — Rather than build their own, they will use an old nest of a crow or a hawk or simply hunker down on a window ledge. — Owl chicks, or owlets, can eat 13 to 17 mice per night during their initial growth spurt in the first few weeks of life. An adult owl will eat about four mice per day. — Young owls begin to venture from the nest at 6 to 8 weeks old, before they can actually fly. Once they leave the nest, they usually do not return, but their parents will continue to provide them until they are able to catch their own food. — If you find an owlet on the ground, it’s best to keep your distance. Getting close to an owlet will stress it out and keep its parents away.